How to make Fedora user a sudoer? I want to give a Fedora user sudo privileges. How do I do that? I use gpasswd because not all versions of usermod have an easy way to add the user to a group without changing all the users' groups. However, on any recent Fedora, usermod username -a -G wheel should have the same effect. You could also use the system-config-users GUI, of course. 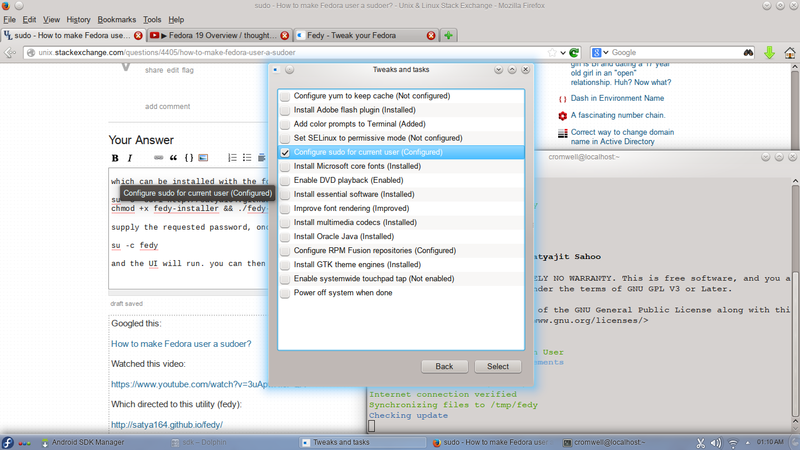 This is the default in the sudoers file on Fedora 15 and newer, so adding the user to wheel is all you need to do. Note that this won't take effect immediately; the easiest thing to do is log out and in again. See also this question and answer over on Server Fault for information on granting sudo-like "auth as self" behavior to wheel group members for graphical apps which use consolehelper or PackageKit. I suppose that the first question is, do you have sudo installed on the server(s) in question? Assuming so, it is just a matter of deciding whether you want to treat the user as a unique entity or as part of a group, a group which may have only 1 member. The command visudo as root will give you access to edit the sudoers file, often /etc/sudoers. These are merely two examples, the sudo package has a tremendous number of features and settings options at your disposal. I recommend reading the sudoers, sudo's configuration file, manual. I would also recommend starting simple and building up to the actual desired configuration. be sure to reboot after you make these changes. Not the answer you're looking for? Browse other questions tagged fedora sudo administration or ask your own question. How do I edit sudoers file in fedora? What is the command for listing all users who are members of the admin group? How do you get NOPASSWD sudo option to work in Fedora 15? How does this command make a user a sudoer? How to open Fedora without a user password? How to retroactively make a script run as root? How do I find out if my sudoer privilege timed out? Why does sudo exist? Why not handle privileged system access as a user permission? Does sudo restrict on which users can acquire superuser privileges?